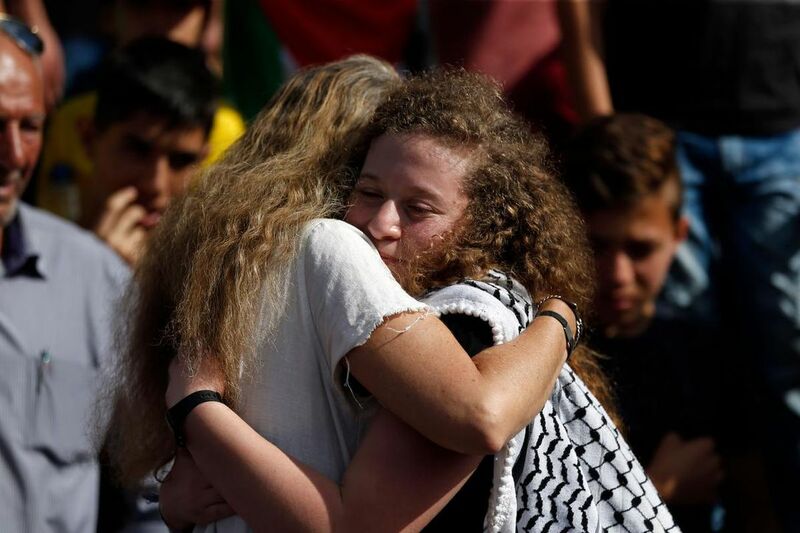 NABI SALEH, WEST BANK—Palestinian youth activist Ahed al-Tamimi was released from an Israeli prison on Sunday after serving an eight-month sentence on assault and incitement charges and arrived home to a hero’s welcome. Tamimi, whose December arrest drew international attention, tearfully embraced relatives as a crowd of supporters jostled for selfies with the teen. Israeli authorities also released her mother, Nariman, who served a similar sentence for incitement. The mother and daughter were indicted by an Israeli military court after a video of the curly-haired teen kicking and slapping two armed Israeli soldiers in protective gear went viral on Facebook. Her mother was arrested shortly after she posted the footage on social media. Tamimi, 17, soon became a potent symbol of the Palestinian protest movement, her image gracing murals and posters around the globe. In her village in the West Bank, Nabi Saleh, activists and residents have staged weekly demonstrations since 2009, when Jewish settlers confiscated some of Nabi Saleh’s land, including a spring that served as its water source. Israeli troops and border police have confronted the demonstrators, firing tear gas, arresting stone-throwers and imposing curfews. Israel says the security measures around Nabi Saleh, which has a population of about 500, and other areas are necessary to prevent the kind of attacks that Palestinians have recently carried out in Jewish settlements across the West Bank. But in the hours after her release from prison, Tamimi said Sunday — sitting in the courtyard of her home — that she “knew a long time ago” that she would be arrested for “choosing this path” of opposition to the Israeli occupation. Her eight-month sentence was the result of a plea deal struck to avoid a lengthy trial, her attorney said. Israel has occupied the West Bank since it captured the land in a 1967 war. Over the decades, it has built numerous settlements that crisscross land the Palestinians claim for a future state, including in places such as Nabi Saleh, which borders the Israeli outpost Halamish. As she spoke to reporters, Tamimi’s unruly blond curls fell over her black-and-white checkered scarf, long an emblem of Palestinian nationalism. Her face was pale and her eyes bloodshot. Nationalists songs blared from loud speakers, including one written especially for her. “Anyone who also chooses this path should prepare themselves to spend time in prison,” she said. Israelis had nicknamed Tamimi “Shirley Temper” for her curls and repeated confrontations with Israeli soldiers. Officials, however, have deemed her a dangerous provocateur. A Sunday headline in the English-language Times of Israel declared that “soldier-slapper Ahed Tamimi” was released from prison. But rights groups said Sunday that her arrest highlighted Israel’s practice of detaining Palestinian minors, who are also subject to the military court system in the West Bank. According to statistics released by the Israeli rights group B’Tselem this month, 291 Palestinian minors were held in Israeli prisons as security detainees and prisoners. “Ahed Tamimi has been released, but only after serving an unjust sentence based on the ridiculous premise that she posed a threat to armed and heavily protected soldiers,” Saleh Higazi, Amnesty International’s head of office in Jerusalem, said in a statement. Tamimi’s father, Bassem, said he could not describe how happy he was to see his wife and daughter back home.